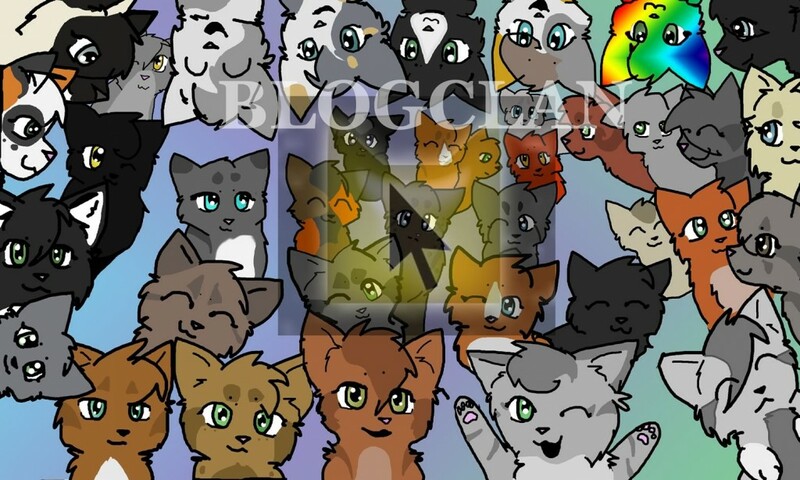 Welcome to BlogClan! We’re glad you came. Here, Kat, one of BlogClan’s senior warriors explains how our community works and how to get involved. Ask questions if you don’t understand something! We have wonderful members here who will eagerly answer! Do you like writing? Put some of your Fan Fiction on Warriors Fan Fiction page. If you don’t get a response at first, don’t be alarmed! The more you post, the more interest you gather! And people do often browse around and read it, but just don’t comment. So, never be disheartened! Do you have some art that you’d like to send in? Click on the Fan Art page (all the links are in the sidebar) and use the email to attach your art! If you have any issues with it, ask our senior members. Have any poll ideas? Post on the Polls page! If you’re lucky, Kate can make it into an official poll on the sidebar. Just want to chat about life? Head over to the BlogClan Tavern! Say anything you’d like, be it Warriors-related, Animal-Related, or anything that you don’t see fit in any other places. Have some Warrior names that you never got to use? Post them on the Warrior Names page. Sometimes, people will rate them and/or say their favorites. Again, as with Fan Fiction, don’t be sad if there are no replies! We can see your comment, and I’m sure we love it! Have you ever had a thought of a Fan Fiction but never got to make it? Put your ideas on the Fan Fiction Collaboration page! You can run your own Fan Fiction, and it’s quite fun! Don’t forget to add your description to the BlogClan Allegiances page, and don’t forget to repost every month! Thanks to courtesy of senior member Jayfrost, we have it updated once a month. Read what you post before you comment! Kate and Josh (Hazelburrow) moderate often, but try to think of what image you give out before you send. Try to have the most fun you can! From the moment you put your first comment, you are a warrior of BlogClan, where we are together! 1,164 Responses to "New Members Page"
1. Whenever Cinderheart is around, yell ‘YOLO’ really loudly. 2. At a gathering, loudly ask Rowanclaw if they’re a boy or girl. 4. Send an email to one of the cats saying, ‘If you don’t forward this, Tigerstar will kill you.’ and watch as the message is forwarded to around the lake. 6. Convince the twolegs that the lake us a really good place for a mall and all they need to do is to tear up the forest and drain the lake. 8. Inform Hollyleaf that Ashfur was very welcome in StarClan. xD I like number 1 and 2. And 5. Hahaha that made me smile 🙂 Funny! SO FUNNY, BRAMBERSTAR WOULD EITHER LOOSE A LIFE TO DYING OF LAUGHTER OR LOOSE A LIVE TO CHOKING ON A VOLE WHILE LAUGHING! ALL HAIL THE MIGHTY GLOW CLOUD. So I have a question for Ms. Kate. Could you possibly say who Reedwhisker’s father is? We know that his mother is Mistyfoot, but we never learn the identity of his father, or the father of Mistyfoot’s other kits. *I am using the official Warriors Website for this. Well. Brindleface and Whitestorm had Ashfur and Ferncloud, Whitestorm and Willowelt are Sorreltail, Sootfur and Rainwhisker’s parents, Willowpelt and Patchpelt are the mother and father of Swiftpaw and Graystripe, and Patchpelt is Longtail’s father.